Wait! Why you should book this villa? You have found a villa with a great beach membership! 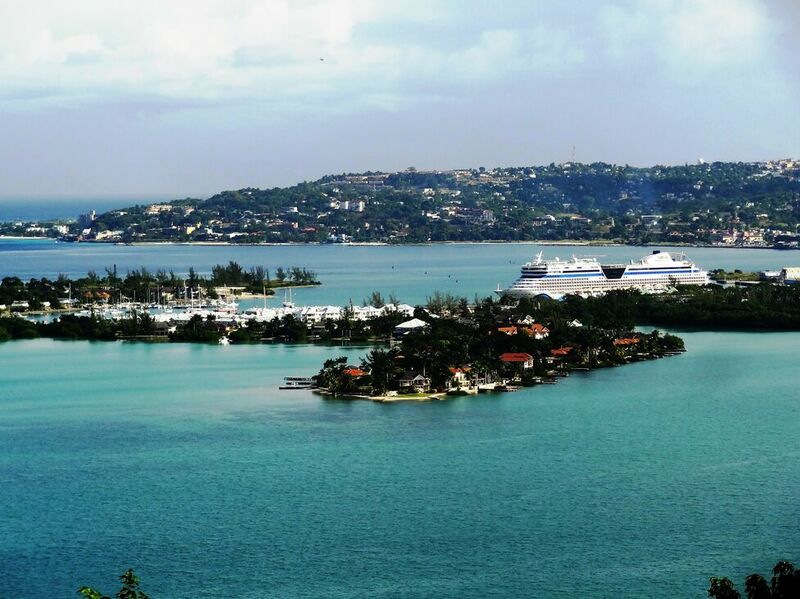 ** Montego Bay Yacht Club and Seawinds Membership + Captains Watersports activities!! Click here to read more !! Spring Garden Villa, is a new 4 bedroom villa, with one of the most spectacular district views of Montego Bay, a spectacular night show of twinkling lights at night! Nestled in the hills of Spring Gardens gated community, lies this newly built luxury villa. 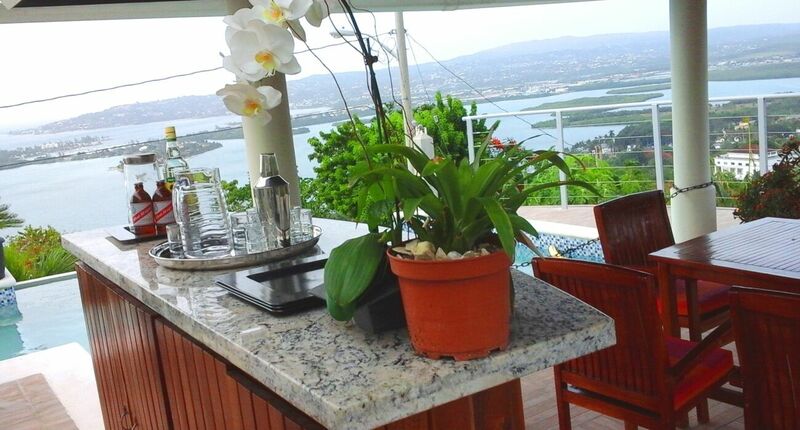 Spring Garden Villa boasts a panoramic view of the Caribbean Sea, overlooks the magical city of Montego Bay and the lush hill side of Spring Gardens. It has a well manicured lawn with beautiful flowers throughout the property. 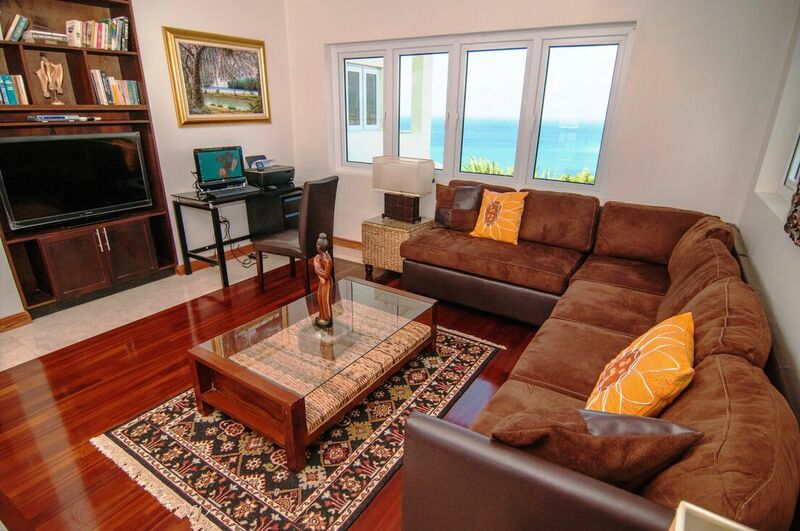 This 4 bedrooms villa is tastefully furnished with exquisite modern décor, mimicking a Suburban-style home. At the front of the villa, is an infinity edge pool with a picturesque backdrop of the Caribbean Sea. Around the pool, is a creatively designed deck that leads you through the front door of Spring Garden Villa, where you will be charmed by the stylish living room. 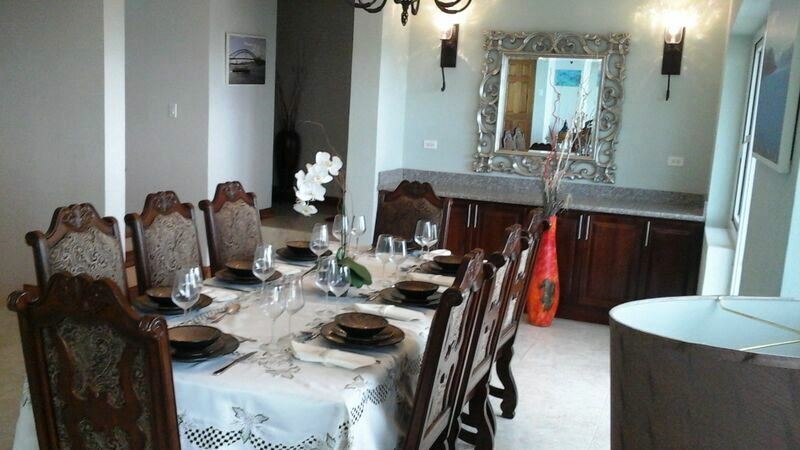 Adjacent to this is an 8-seater contemporary dining area which opens to the kitchen. On the same level, you will find Bedroom # 1 & 2, while Bedroom # 3 & 4 are on the second floor. All the bedrooms have an air-conditioner and a comfortable king-size bed with a private bathroom. Seascape offers two twin beds convertible to king in ONE of the four bedrooms. Each room has an almost identical theme and is sophisticatedly presented. Bedroom #1 has a breath-taking view of the ocean and a stunning bathroom. There is a door from this bedroom that leads to the pool deck. Bedroom #2 has impeccable furnishings with unique bathroom fixtures. To make your way to the second floor, there is a well polished wooden interior staircase. This takes you to a lounge area equipped with a flat screen TV and a ceiling fan. Bedroom # 3 is the Master Bedroom which has a stunning view of the Caribbean Sea, an exaggerated bathroom with massage shower, bath and a walk-in closet. Bedroom # 4 has access to an outdoor patio adorned with contemporary wicker furnishings that can seat 4 persons. Spring Garden Villa is the ideal villa for families or couples and is approximately 6 miles from Montego Bay. There are so many activities to choose from! Less than 10 minutes drive to Pier One, Margaritaville and Acropolis Gaming Lounge; perfect for anyone in need of exhilarating entertainment and a lively atmosphere. Let’s not forget that this villa comes with a complimentary membership to the renowned Tryall Club. Infinity Swimming pool which has views towards Montego Bay! Spectacular! Beach Membership for all guests - a short 8 minute drive away to Beach Club Resort facilities - First Class! Special to your group when booking this villa!!! Villa guests will have complimentary beach passes to Jamaica's Montego Bay Yacht Club. Membership includes access the beach with watersports by Captains watersports. (Fees may apply to various water sports.) Villa members also enjoy discounts at the 3 restaurants! Enjoy the large swimming pool at the Seawinds Beach Club! White sandy beach fun for you and your family! Your complimentary membership allows you this access! Tennis Courts for you to play! Wonderful lunch and dinner atmosphere! 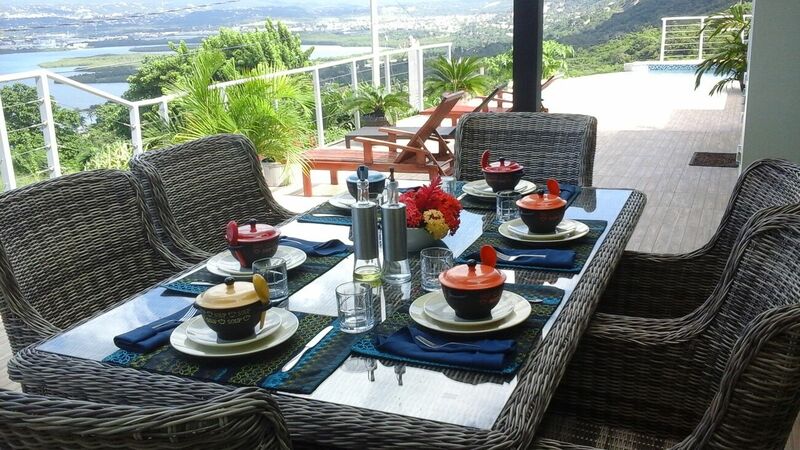 One of the best restaurants in Montego Bay. Have a wonderful dinner at the Montego Bay Yacht Club. Enjoy discounts for villa members only! Robbie's Seahorse Grill. Try the lobster dish! Local favourite dishes and international cuisine. A wonderful night out on the town! Enjoy cocktail drinks and topical Jamaican favourites! * Free access to Seawind Club! Beach! Beach! Beach! * For lovers of sun, sand, ocean and relaxation. * Conveniently located a short walk from MBYC. ** Membership to for all guests staying at this villa!